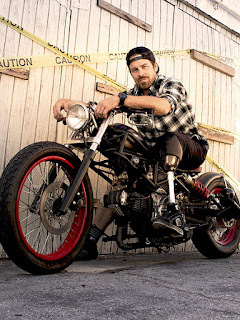 In 2006, Kurt Yaeger was in a serious motorcycle accident that severely injured his left leg, and he was faced with the decision of whether or not to amputate it. "The doctors said they were going to try to save more of my leg. I asked them how much usage I was going to have out of it, and they said 5 percent," Yeager, 39, tells PEOPLE. "Then they explained to me that an amputation might give 15 percent usage, and I said, 'Well cut it off.' "
"Making the decision was just a matter of fact," he continues. "It doesn't mean it was easy, but it was a factual piece of information, not emotion." Yaeger says the emotional aspect of amputating his left leg was much more difficult to overcome than the physical one. "There were two stages of acceptance," he says. "One was physical, and that was easy. The second piece of it was the emotional – dealing with the long-term ramifications, and feeling like I was going to be Frankenstein." After overcoming the emotional hurdles, Yaeger was more determined than ever to pursue a career in acting. "I grew up doing plays and shooting videos with friends, but I never took it as a serious career," he says. "My motorcycle accident forced me into a position of deciding what I really wanted to do with my life. I said, 'Life's short, let's do it all the way.' "
At first, Yaeger was worried that his disability might put him at a disadvantage. "It dawned on me that it would be harder to get work, but I really think that it was more of a life question versus how viable it actually was to work in Hollywood," he says. Yaeger mastered being able to walk without a limp, and wore pants to auditions. "Most people find out that I'm missing a leg only after the fact," he says. "I spent a lot of time learning how to walk without a limp so that their first impression of me was not going to be a negative one, unfortunately. For a lot of actors with disabilities it's unfair." Yaeger's determination paid off. He landed a role on Sons of Anarchy, and his new Cinemax show Quarry will debut in September. He also recently booked a major recurring role on NCIS, as well as roles on Pure Genius and Shooter. "The exposure is fascinating," he says. "I get to spend a lot of time talking to different people on social media, who reach out to me and tell me how my story has helped them. I would have never guessed that being in the public eye would have put me in the position of being inspirational. I'm just doing what I do!" Yaeger says people reach out to him regularly for help and advice. "I always tell people to go out and fail on a regular basis, because that's the path to success." Television’s track record for telling stories involving individuals with special needs is spotty, and particularly tricky when it comes to comedy. That’s something that “Speechless” executive producer Scott Silveri sounded well aware of during a Thursday morning panel at the Television Critics Assn. summer press tour in Beverly Hills. 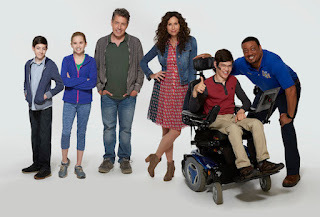 Centered on a family navigating the issues that can arise while raising a nonverbal special-needs child (portrayed by actor Micah Fowler, who has cerebral palsy), “Speechless” is a story Silveri said he had long wanted to tell after being raised with a brother with special needs. But, the former “Friends” producer was wary of how to tell it. “Part of the reason why it was a scary endeavor is it does announce itself in such a way,” said Silveri. “You just hear the logline of a show with a kid with a disability, it suggests that ‘After School Special’-ness. That’s why we were really vigilant about doing everything we could to subvert that as early as possible. In the series, Minnie Driver plays a mother who must be a strong, and even strident, advocate for her son, including confronting a public school about a wheelchair access exit that doubles as a trash ramp. Fowler’s character, J.J., is nonverbal on the show, and an aide portrayed by “Reno 911” actor Cedric Yarbrough acts as his voice. He too was aware of a need to transcend cliches in his role. In answering a question about the makeup of the “Speechless” writers’ room, Silveri noted his hopes to also avoid the usual TV tropes that can surround special needs individuals. “We have a lot of people on staff who have experience in this world, whether it’s having siblings or special needs children,” he said. “We don’t want [the show] to be all about that, but when it is we want to get it right and we feel a real responsibility.